I just decided to write about this stop along our list of 61 (I think) “Things to Eat in Connecticut Before It’s Too Late” according to Michael and Jane Stern’s book on so-called Roadfood. Why? Because although it is only mid-October, the temperature is hovering around freezing as frozen rain and snow is pelting the window. 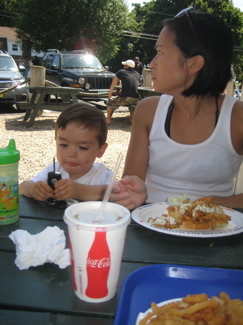 One of Hoang’s favorite foods is fried clam strips. In fact, she really likes all types of fried seafood whereas I usually go with the baked or raw. But I have a soft spot for fried clams… It was “my” special meal at Howard Johnson’s when my family would have our big nights out. I loved ’em and ordered them just about every time I think. For no apparent reason, though, I haven’t had them much in adulthood… Again, maybe because I so much prefer sautéing my own littlenecks in some butter and wine with a few aromatics and warm clarified butter. 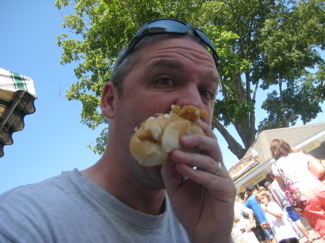 But I don’t want to sound snobby… Fried clams are delicious when done right. And that means plump and soft and not-too-chewy. Flavorful and fried in clean oil and cooked for just the right amount of time. Lenny and Joe’s has nailed it. 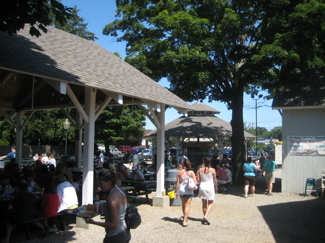 Of course, they’ve been at this for a while; originally a “roadside clam stand,” they opened with just four picnic tables in 1979. Over the years they’ve expanded their menus and their restaurants, now having three full service places in Westbrook, New Haven and Madison. Both are often packed with diners, but their ordering system seems to be pretty efficient and on a sunny day, there is plenty of seating. 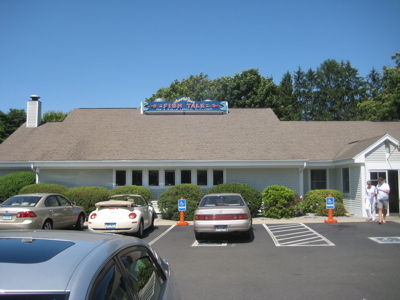 We had lunch there after a July Sunday down the road at Hammonassett Beach – and only had to wait maybe 10 minutes to be served at the counter even though there were at least 200 people there. Quite impressive. There it is… In all its glory. At first, I was daunted by the crowds inside. With a tired Damian, long waits are never fun. But I quickly noticed that the swarm of people was actually several different ordering lines and once I was in one, I was face to face with an order-taker before I knew what I was getting. 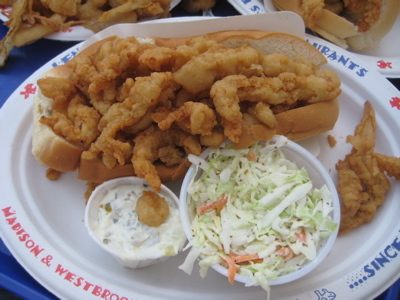 I went with two clam rolls because that seemed more “lunchy” to me. It came with a small little capsule of (really good) coleslaw. I took my receipt and sought out my family while waiting for the order to be completed. There is a real carousel out there! While not as historically significant as the Bushnell Park carousel, Lenny and Joe’s is worth a visit anyway. 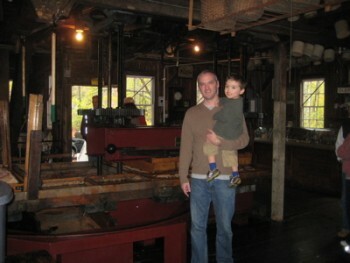 Delivered in 1999, it was the first new, all-wooden Dentzel Carousel installed East of the Mississippi in over 70 years. It is surrounded by a hand crafted wrought-iron fence. It is called a “flying Menagerie for Charity” because all proceeds from the Carousel are donated to local charitable causes and organizations. There is a $1.00 charge to ride the Carousel, but 100% of it goes to these charitable causes. 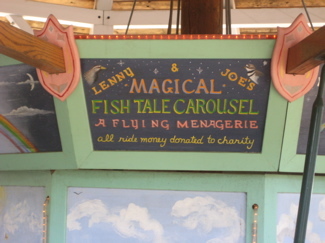 Both of the Lenny & Joe’s Fish Tales absorbed the cost of the Carousel, all of the site improvements and pay the yearly operational and maintenance expenses. Certain periods of time are designated for specific charities. Their 10 Year Total is $550,855. The Carousel is a 20-foot diameter stationary, 10 rider, all wooden, handmade carousel. It is operated by an electric motor. The Carousel is a real “flying horse” type of carousel. The animals are attached from sweeps on the top, and swing and fly through the air! 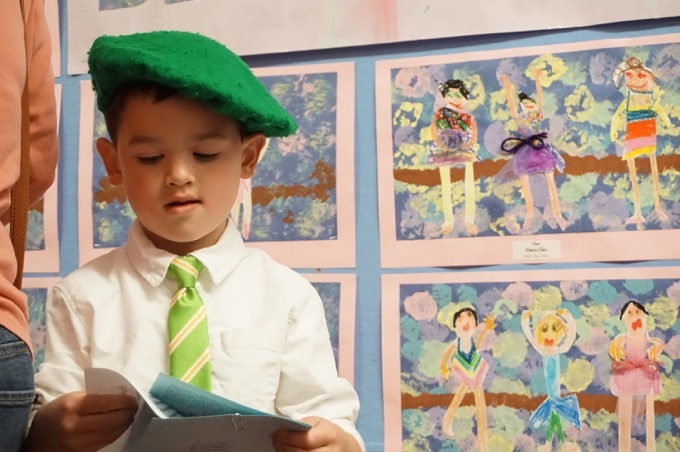 The menagerie animals include: Hippocampus, Frog, Giraffe, Lion, Horse, Cat, Seal, Orca and a Double Lobster Chariot. Riders can enjoy trying to ‘Catch the Brass Ring” from one of the two traditional ring catching devices. Small lights accent the carousel and a CD player provides traditional merry go round music. All of the animals were hand carved by Bill Dentzel. They were made of Basswood, using traditional hollow box construction. Each animal was a unique Dentzel design! Donna Wolcott, a local professional Carousel painter and restorer, painted most of the carousel animals. She also has been maintaining and touching up the animals every Spring. As cool as that is, Damian refused to ride. But no matter, after checking that out I heard my order number over the loudspeaker and it was time to eat. Mmm-mm. Delicious. Everything fried clams should be! The idea of it on a roll is a bit silly as the bread coupled with the breading on the clams is a bit much. 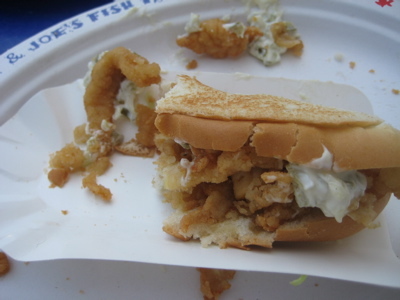 But the tartar sauce made it just moist enough… Otherwise, we’d just have eaten the darn clams with our fingers. I have no idea how the other menu items are here, but I’m sure they are very good. 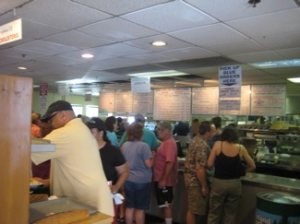 With so many restaurant choices in the area, the crowds tell me that Lenny and Joe’s is one of the best. 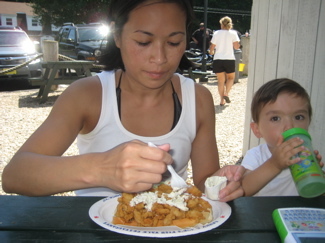 Gee, didn’t know the fried clams thing (at HOJO’s no less) was a continued family tradition. When your mom and I were kid’s that was our big night out, too. That and spaghetti at a place called Katie’s. Does your mother still hate parmesan cheese? Being much younger I felt so much more sophisticated wanting the parmesan. At least until I put it on your mother’s food just to get her mad. Lenny & Joe’s has been a favorite of my family for years. It’s always a good choice. My Lenny & Joe Story: I was there one very busy night with friends, waiting for a table while sitting on the benches between the bar and the front door. The restaurant kept various timewasters available to help make the wait more bearable, and someone handed me an Etch-a-Sketch, with which I cranked out a quick doodle of the Fish Tale logo. Somehow, it got passed along to the bar without getting shaken, and when the bartender got hold of it, I got free beers for the night.